The urban farmer has to remember that urban environments typically experience higher temperatures than suburban areas because the paved surfaces that abound in urban areas lead to a lot more sunlight penetration. The roofs, buildings, and paved surfaces of the urban setting heat up and reradiate the sunlight, causing increased temperatures. Sunlight is essential for the development of your garden and landscape plantings; you just have to know how to use it. By choosing the right plant materials and putting them in the right places, you can lower your cooling costs significantly, reducing the need for air-conditioning systems and, in turn, reducing carbon dioxide emissions. 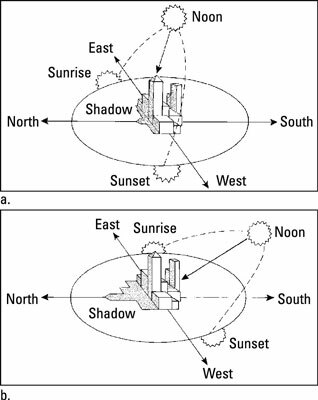 In the continental United States, the sun travels east to west along a southern exposure. The solar angle changes from summer to winter, but the sun continues to always travel east to west and the duration of sun exposure changes season to season. Understanding the difference between summer and winter solar angles can help you employ strategies to either increase or reduce solar impacts to your urban garden and thus help improve your landscape’s overall microclimate. In cold or temperate climates, the goal is often to capture as much sun as possible during the winter season and to provide shade from the heat of the summer sun. Placing deciduous trees along the path of sunlight helps accomplish both strategies by maximizing a cooling effect in the summer while providing solar exposure for more heat gain in the winter season. Another sunny aspect urban gardeners may have to contend with is solar glare. Solar glare is the indirect sunlight that’s reflected from surfaces such as pavement, water, building facades, signs, billboards, and other reflective surfaces. The additional gain of indirect lighting may help or hinder your garden plantings. Urban gardeners with gardens in the shadows of surrounding buildings may welcome any reflective indirect sunlight from solar glare. In urban gardens that are exposed to normal direct sunlight throughout the day, gardeners may want to minimize as much indirect/additional exposure due to solar glare as possible. Cities have higher temperatures than their surrounding suburbs. 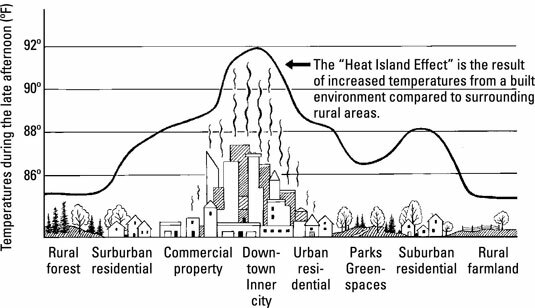 This phenomenon is known as the urban heat island effect, and it’s due to the fact that urban environments include so many heat-absorbing surfaces, such as roofs, concrete, and asphalt-paved surfaces. One of the main causes of the Heat Island Effect is the changing of land surfaces to other materials that retain heat, like concrete and asphalt. A secondary contributor is waste heat from human sources such as cars, air conditioners, and factories. The Environmental Protection Agency (EPA) recognizes that while some Heat Island Effects can be positive, like extending the plant-growing season, many of them have more negative impacts, such as increased energy consumption, elevated amounts of pollutants, compromised health and comfort, and impaired water quality. What can you do to help reduce this Heat Island Effect? Develop urban green spaces and plant trees and shrubs. Planting trees and shrubs and developing green spaces, such as gardens, within the urban environment helps decrease the Heat Island Effect and reduce temperatures. These planting surfaces help retain and absorb sunlight rather than reflect the sun’s rays. Use green roof systems. Green roof systems provide many benefits. When used on a community-wide scale, they help reduce the Heat Island Effect by decreasing areas where reflected heat gain from solid roof surfaces can occur. Green roofs also provide a useable and aesthetic urban amenity by retaining rainwater, reducing the amount of storm water runoff and retaining and returning water to the atmosphere through transpiration and evaporation. The added vegetation on a green roof can create a small microclimate of cooler air in the summer months, decreasing your need to air-condition your home. Increased vegetation in cities also helps lower dust and particulate matter, in turn, cleaning the air and reducing smog. Avoid synthetic fertilizers and pesticides. Use people-powered or electric-powered equipment rather than gasoline-powered. Minimize the use of soil amendments such as mined minerals, peat, and bagged organic fertilizers, whose harvesting, mining, manufacturing, and transporting use energy, release carbon, or disrupt the environment. Plant trees and shrubs that are well-adapted to your region and that will sequester and store carbon. Choose landscaping materials with a low carbon footprint. Buy your materials locally, save gas, and therefore decrease carbon emissions. Use salvaged wood and repurposed materials. Generate your own energy through solar power, wind power, or hydro power. Use cover crops and mulch to cover bare soil to prevent carbon loss and soil erosion. Minimize your use of garden plastics (in mulch, pots, and so on). It is important to note some realities here on carbon reduction. While efforts to individually decrease our carbon footprint will not have any significant impacts to reduce urban temperatures, a greater community-wide effort here can decrease the urban Heat Island Effect.